Now, patients who are missing teeth have a strong, beautiful alternative to bridges, partials, or full dentures. Dental implants are the permanent solution to improve your smile and your lifestyle. They look, feel, and function just like your natural teeth. Dental implants can be used to anchor bridges, partials, or full dentures to eliminate uncomfortable slippage. As the leader for dental implant dentistry in Chaska, we can handle the entire procedure completely in-house. Dental implants can be used to fill the space of one or more missing teeth. This permanent solution for tooth loss allows you to regain your ability to eat and speak while promoting your oral health and quality of life. After completing a thorough evaluation, your dentist can tell you whether you’re a candidate for dental implants. In order to be qualified for implants, you will need to have good bone density and oral health. However, in some cases, bone grafting can be used in combination with the implants to give your artificial teeth a sturdy foundation. The first stage of the procedure involves surgically inserting titanium implants into the jawbone to serve as the roots for each missing tooth or as an anchor for a bridge or denture. Nature will take its course, allowing bone to fuse with the titanium implant. Once the bone has properly healed around the implant, your implants will have a solid foundation. Once the implants are secured, a restoration can be added. Chaska Dental Center can fabricate hand-crafted, permanent crowns or dentures according to the dentist’s design based on a patient’s individual needs. The custom-made crowns will match the size and color of the existing teeth, so they’ll blend seamlessly with the smile. We will secure the restoration right in our own office. By imitating an entire natural tooth from the root up, dental implants offer a prosthetic that closely mimics nature. The result? 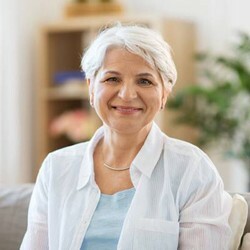 Dental implant patients enjoy completely restored function, which enables them to enjoy a healthy diet of hard-to-chew foods that would otherwise need to be avoided. The ability to speak clearly will also improve dramatically. 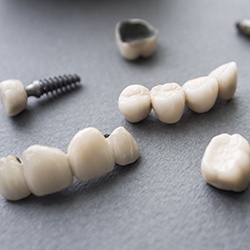 In addition, replacing missing teeth with a dental implant will help preserve the bone, teeth, and surrounding structures from deterioration which occurs over time with tooth loss. 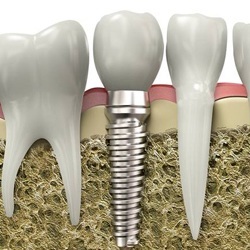 By replacing the tooth’s root as well as the visible crown, dental implants provide a comprehensive solution that promotes healthy bone and periodontal tissue. It is easier to speak clearly with dental implants. Dental implants look, fit, and feel just like the natural teeth. Dental implant procedures have a success rate of over 95%, which is better than natural teeth. Dental implants can last a lifetime with proper maintenance and a healthy lifestyle. Your remaining natural teeth are not affected, as is necessary with a fixed bridge. Dental implants consistently end up being the best financial investment. Individual fees may vary by the following points and may have an impact on the overall treatment plan. The number of implants being placed: Dental implant posts are individually priced, so this will impact your overall investment. In cases of multiple tooth loss, however, you will not necessarily need an individual implant post for each tooth. The amount of bone available: When the teeth have been missing for a longer period of time or if you have a severe case of gum disease, you may need a bone graft to create the proper environment for dental implants. No matter what the cost of your dental implants, they are worth their weight in gold! Nothing else provides as much social and functional security while also promoting better oral and overall health. Have Any Questions About Dental Implants? With a dental implant in Chaska, we’ll give you the strong and secure new smile you need to boost your confidence. Plus, you’ll also have a new enjoyment of life as you’re able to eat and speak without the slipping or discomfort of traditional dentures. Are dental implants right for you? Call today for a consultation.